An encapsulating cleaning surfactant is fortified with non-resoiling polymers to create a low moisture carpet cleaning solution that encapsulates and surrounds soils that have been dislodged from the carpet surface and holds them in suspension for removal by subsequent vacuuming. CleanMaster manufactures two encapsulation solutions. 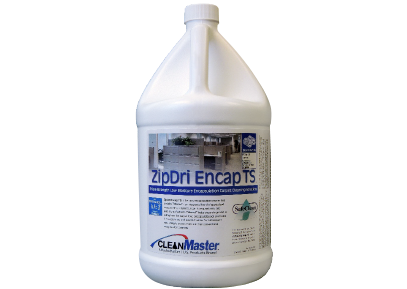 ZipDri Encap TS is the most ultra-concentrated encapsulation cleaner on the market, utilizing only 2 to 4 ounces of solution per gallon of water. It is the only encapsulation cleaner with Tritanol™ – you will experience faster, deep restorative cleaning in high definition, and the carpet will stay cleaner longer. Perhaps the most important attribute of ZipDri Encap TS, is that it is formulated so that it can be effectively used with virtually any low moisture agitation system. If you are cleaning a lot of dull looking commercial carpet Release with OxyBreak™ works extremely effectively as a low moisture encapsulation solution to clean and brigten the appearance of the carpet. 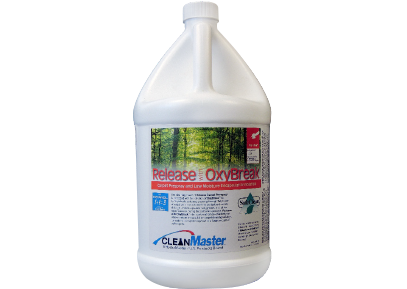 In addition, the OxyBreak™ additive makes it an extremely effective encapsulation cleaner on carpets subjected to a high amount of coffee and beverage spills. The coffee stains will disappear while you are cleaning.